Mark your calendar for two upcoming PTP fundraisers! Two fundraising events are in the final stages of planning, with proceeds to support the programs of Progress Through Preservation of Greater Akron (PTP). The first fundraising event is the second annual Dining in Akron History scheduled for Sunday, October 7, where guests will celebrate the month with a memorable dining experience in one of several fine historic homes. The event will be open to the public but seating will be limited; the event is expected to sell out quickly. For details and reservation information, click HERE. 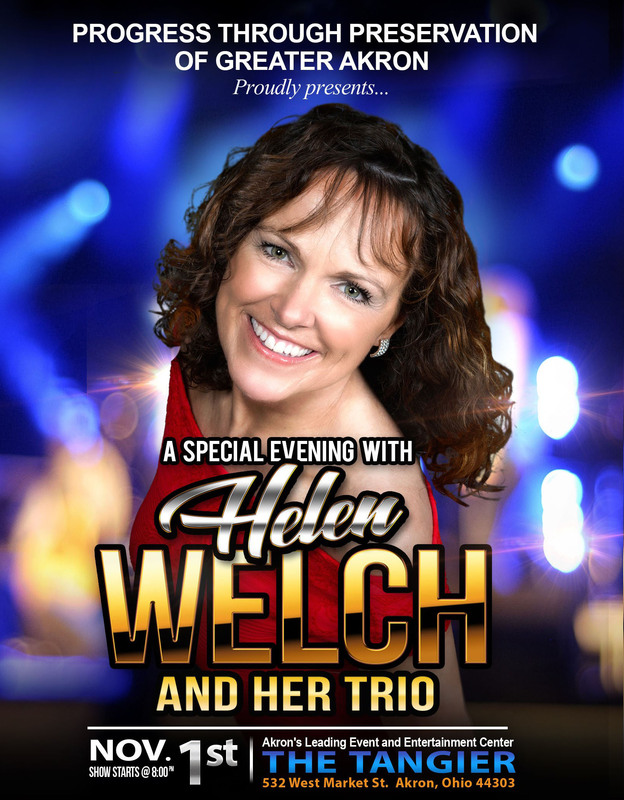 The second scheduled event, a concert event and live auction, will take place on November 1 at the iconic Tangier in Akron, when Helen Welch will present a special concert for our guests. Full details will be available soon, but in the meantime, click HERE for a preview of the info. The information will soon be live on the Tangier website! In mid-April 2018, the former St. Paul's Episcopal Church, located at the corner of Forge and East Market, was seriously damaged by fire. Progress Through Preservation of Greater Akron (PTP) had been in conversation with The University of Akron about this at-risk property for some time before this event, and hoped to recommend some options for adaptive reuse of this historically and architecturally significant building on the UA campus. Related to this, an article was published in the Akron Beacon Journal on July 29, 2018. As part of its long-range planning process, The University of Akron has submitted a request to the State of Ohio for funds to pay for capital projects. Included is a request to demolish several historic Akron buildings, the former St. Paul’s Episcopal Church and Sunday School and Parish Hall on East Market Street and four buildings in the Quaker Square complex. The parish hall and Quaker Square buildings are listed on the National Register of Historic Places. As our community’s historic preservation advocacy organization, we are concerned about the fate of these historic and architecturally significant buildings. In response to the proposed demolition of these structures, PTP has presented a letter of concern to The University of Akron administration and met with a university representative. PTP will continue to advocate for the preservation of Akron’s rich architectural heritage and dialogue with local stakeholders and community leaders, including The University of Akron and City of Akron. As part of that initiative, PTP invited representatives from the East Market Street area and other city leaders to a meeting on May 16, 2017, at the historic First Congregational Church in Akron. Discussion focused on the importance of re-purposing the historic former St. Paul’s Church buildings, formerly The University of Akron’s Ballet Center, and sharing information on how we can use the preservation of our historic structures as anchors for the continued redevelopment of this and other areas of Akron. For more information about this meeting, or to ask questions or share concerns, please contact Dana Noel, PTP president (330-322-6159 or dana@jerainc.com) or John F. Myers, Advocacy Committee chair (330-819-3695 or johnmyerscolpa@gmail.com). Click HERE to read more about PTP’s position as printed in our January/February 2016 newsletter and PTP board member Bob Dill’s brief history of the church buildings. National Register of Historic Places original nominations for both sites may be accessed from the Akron-Summit County Public Library Special Collections Division website, listed alphabetically. The U. S. House and Senate have now passed comprehensive tax reform for the first time in more than 30 years. With these new regulations, Congress has once again concluded that it is critically important and of national concern to protect our nation’s historic buildings and the unique heritage that they represent. Initially the historic tax credit provision was not included in any of the early versions of either bill. The House-Senate Conference Committee belatedly reached a deal that included the Senate language to restore a full 20 percent credit, but with a modified, extended five-year payout. Ohio Senator Rob Portman and 13 of 16 Ohio Congressional representatives supported the Senate language, crucial support that precipitated a tipping point in the move to keep the historic tax credits in place. THANK YOU to all the members of Progress Through Preservation of Greater Akron and friends of the historic preservation movement who helped mobilize support to make sure the Federal Historic Tax Credit remained in the new tax code as a continued source of funding for the rehabilitation of our historic buildings. We are immensely grateful to the individuals who took the time to petition our legislators, educate our neighbors, and in every way sound the call to keep the historic tax credit program in place. It is an essential tool that has provided the foundation for the financing of almost every significant adaptive reuse of a historic building in our community in the last 35 years. The preservation community’s voice was heard, and the historic tax credit, first made permanent in the 1986 Federal Tax Code, will remain—with some adjustments, but sufficiently intact to maintain continued restoration of our treasured past. It is a wonderful accomplishment and affirmation of the power of preservation to protect our heritage, foster economic development, and create jobs that encourage community growth.